It is often assumed that landlords don’t want to give people long leases preferring to see people leave and obtain a rent increase where possible. This belief doesn’t factor in several concerns, firstly is that rents are not always rising, that moving is an inconvenience to both tenant and landlord and that there are some hard costs to factor in. 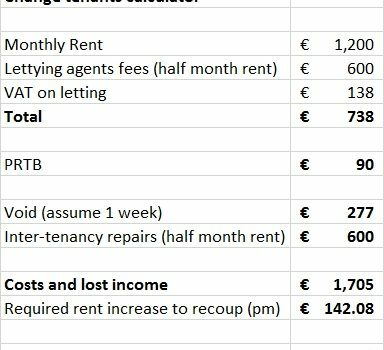 For this reason we created a small basic calculation to show that in many cases the recouping costs equate to more than a months rent and that a landlord would have to increase rents by about 12% to break even. The other thing that happens is the landlord takes on a new risk of an unknown tenant, good tenants are like good credit applicants, they often don’t pay top rates because of their past performance, a new person might be habitually late, break more, or be more high maintenance. This is yet another reason that shows the benefit of a long lease to a landlord, equally the tenant also benefits by having the protections of a fixed term lease which are relatively absolute. The way to deal with rent changes or fluctuations can be dealt with within the contract, one route is to have a review every number of years and have a clause whereby rents won’t go up or down by more than 10% every three years. 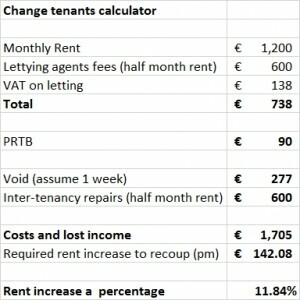 This avoids the necessary ‘catch up’ the calculation above shows – don’t forget that in this instance the 12% increase has to come about just to stand still, it’s only getting the landlord back to their break-even point.